Israel and South Africa: A ‘downgraded’ relationship? The first stage of a “downgrade” — that’s what South Africa’s Department of International Relations and Cooperation has called its latest decision regarding its embassy in Tel Aviv. In May 2018, South Africa recalled its ambassador to Israel following clashes between Israeli military forces and protesters during which at least 52 Palestinians were killed. 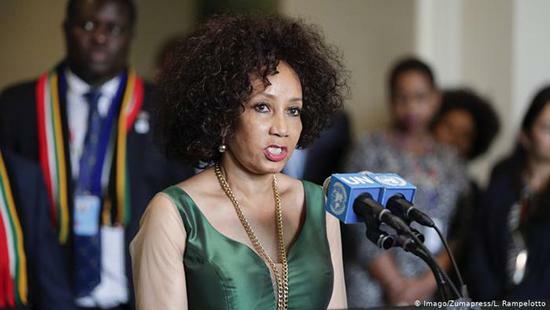 In a recent speech, South African Foreign Minister Lindiwe Sisulu (pictured above) clarified that a decision had now been made to not replace the ambassador. The embassy, which would be downgraded to a liaison office, “will have no political mandate, no trade mandate and no development cooperation mandate. It will not be responsible for trade and commercial activities,” Sisulu stated. However, consular services, such as visa issuing, would remain in place. The move comes ahead of Israel’s elections on April 9, and, though South Africa’s position on the country may not bear the same weight as that of the United States, it can be seen in strong contrast to Washington’s policy. The US recently moved its embassy from Tel Aviv to Jerusalem and controversially recognized the Golan Heights as part of Israel — both actions are seen by many to work in favor of Prime Minister Benjamin Netanyahu’s government. To observers of South African politics, the move comes as no surprise. In 2017, members of the ruling African National Congress (ANC) adopted a resolution calling for the downgrade of the embassy in Israel in order to draw attention to Israel’s settlement policy . Not only were South Africa’s anti-apartheid groups allied with the Palestinian Liberation Organization (PLO), the Israeli government was viewed by many as a backer of the apartheid regime. Whether the downgrading of the embassy will actually have a strong impact is another matter that analysts are uncertain about. Trade ties still exist and for now South Africa’s foreign office has not announce it’s next move. The statement further noted that Foreign Minister Sisulu would still need the backing of Parliament and the Cabinet in order to make this policy official.